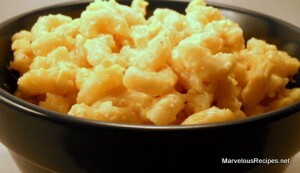 Bored with “out of the box” macaroni and cheese? Give this rich, cheesy recipe a try. It will be love at first bite! 1. Cook elbow macaroni according to package directions; drain and set aside. In a 2 quart saucepan over medium heat, melt butter or margarine. Add onion, salt and pepper and cook until onion is crisp-tender, about 3 minutes, stirring occasionally. 2. In a small bowl, combine flour and milk until smooth; stir into the onion mixture. Heat to boiling, stirring constantly for 1 minute. Remove from the heat and stir in the cheese cubes until melted. Add macaroni and blend well. Spoon macaroni mixture into an ungreased 1-1/2 quart casserole dish. 3. Bake at 375 degrees F for 30 minutes or until bubbly and lightly browned. Yields 5 servings.